I purchase vegetable and flower seeds from a handful of seed companies. All offer high quality seeds, organically grown when possible, and at reasonable prices. High Mowing Organic Seeds of Wolcott, VT is one of those companies. 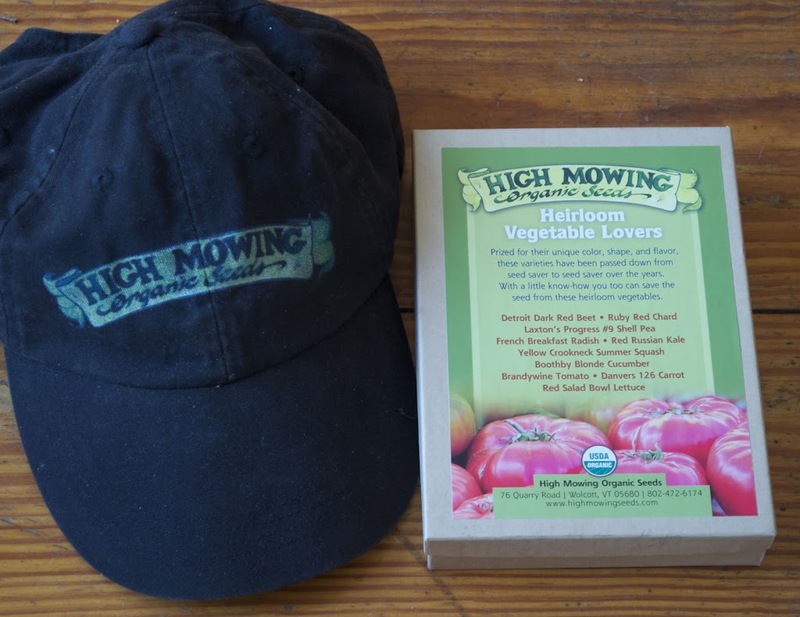 And now for the giveaway: A “High Mowing” cap and their boxed set of seeds for heirloom vegetable lovers. The box includes packets from such old-time favorites as Brandywine tomato, Red Salad Bowl lettuce, Detroit Dark Red Beet, Red Russian Kale, and others. To enter this giveaway, in the “Comments” box below tell us about some of your favorite heirloom vegetables. Winner of both the hat and the box of seeds will be selected randomly and contacted for mailing by email. There must be a converse to the saying, “Be careful what you wish for . . . “ And if there is, I’ve realized it. I wrote, a couple of weeks ago, about the so-called hardy orange, Poncirus trifoliata, which, with warmer winters, now seems hardy in my garden. I’m looking forward to fragrant flowers and “oranges” that have a citrus-y smell even if they are too tart and bitter to eat. Last time, I also mentioned one especially striking variety of hardy orange, Flying Dragon. 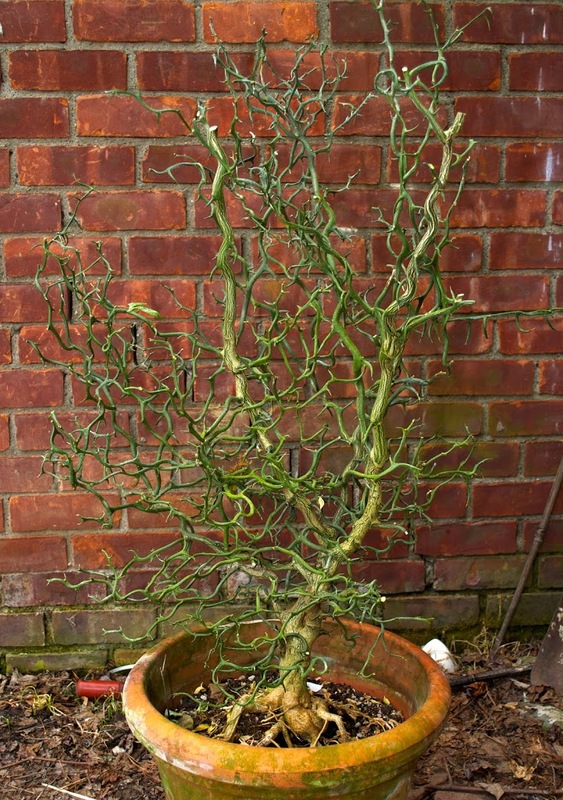 This variety has the thorny, evergreen stems of the species, but the stems wriggle and squirm and twist every which way. It’s very ornamental, and also, like the species, will have fragrant flowers and orange fruits to come. I saw a Flying Dragon sitting in a pot at a consulting job last week and mentioned my affection for the plant. “Take it,” I was told, “it’s an extra.” I did, and am now the proud owner of a 3 foot high Flying Dragon. The march of vegetables is on its way. 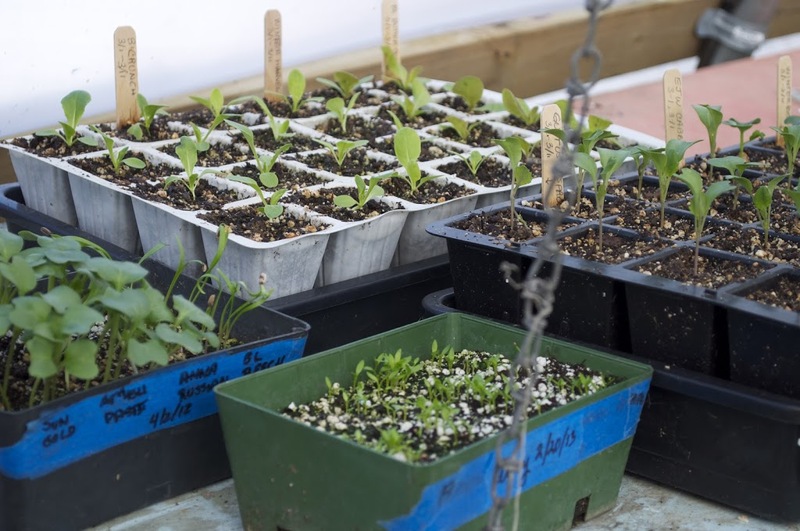 With decades of growing vegetables under my belt, I have a schedule for sowing seeds indoors, transplanting seedlings, and sowing seeds outdoors. It’s not a schedule writ in stone, though. Each year it gets tweaked as my experience grows, and to account for recent years’ earlier warming springs. My schedule is applicable to other gardens with average date of the last killing frost in spring of mid-May. It’s even applicable to gardens elsewhere by merely shifting sowing and transplanting dates forward or backward by the same number of weeks they differ locally from the May 15th, last frost date at my farmden. July 15: third seeding of bush beans. The nice thing about having this schedule is that the weather no longer pushes me around. A warm, sunny day in the middle of April might tempt me to plant corn — except if I look at my schedule. The year before last, the last spring frost was in early April, so corn could, in fact, have been planted earlier. Last year provided greater temptation with a spate of 70 degree temperatures in March. The mercury plummeted in mid-May, which would have snuffed out the corn sprouts. 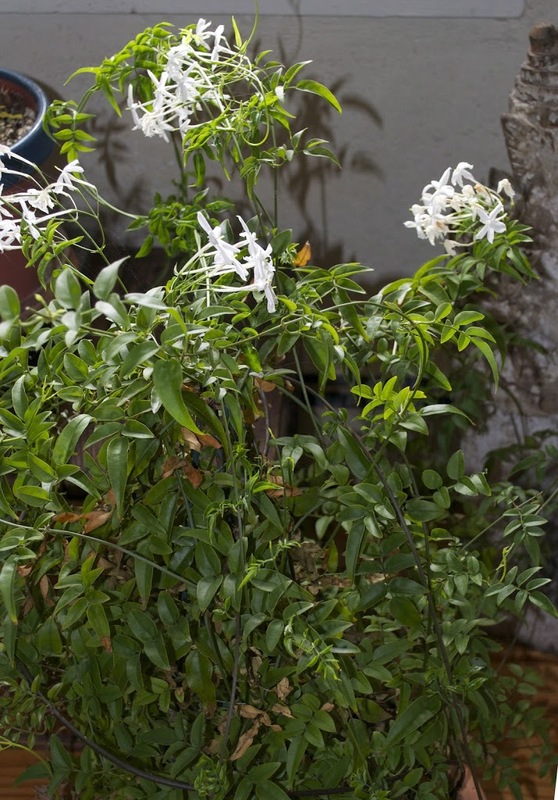 Shoots terminated in branching stems with round buds hinted at flowers to come and now, after a long, slow buildup, flowers have finally opened on my poet’s jasmine (Jasminium officinale). For many years this plant has disappointed me with no or paltry flowering, to the extent that I threatened to walk it to the compost pile if this year was a no-show. That threat was made easier because I now have another kind of “jasmine” (Cestrum nocturnum) that blooms more freely (with a different aroma). The threat evidently was effective. At least that’s my only explanation because I can’t put my finger on exactly what I did differently this year. Sun, water, and fertilizer kept the plant growing well through summer and some thirst and a spell of exposure to near freezing temperatures in autumn were supposed to make for abundant blooms. Or so I’ve been told. But I’ve heard that and done all that for years. Then again, last year I did pinch out the tips of growing shoots through summer, something I haven’t done previously. Perhaps that’s what brought on the better, but still hardly abundant, flowers. So the plant gets pinched, and gets to live — for at least another year. This entry was posted in Uncategorized and tagged High Mowing Seeds, jasmine, poncirus, sowing schedule. Bookmark the permalink. Trackbacks are closed, but you can post a comment. I love Rainbow Swiss Chard, and any variety of purple tomatoes (our CSA farmers grew a variety)! Last year my favorite heirloom tomato was Amish Paste. I’m experimenting with more heirloom varieties this year, especially peas and beans. We love heirloom greens and squashes. Cherokee purple tomatoes and Black beauty eggplant are my favorite heirloom varieties. I will also try Red Russian kale this year. I don’t think it classifies as an heirloom, but it is old : Scarlet Runner Beans must be one of my favorite plant to grow. It is easy and produce abondantly here and it is definitely one of my first success that made me love gardening. I love Bull’s Blood Beets, it’s a beautiful plant and all part are tasty. Last year my 4 year old son planted Rattle Snake Beans, an easy one for little ones. It was a success and it was delicious. I love growing Cherokee Purple and Black Krim tomatoes. I never knew there were colors other than pink/red until I started gardening a few ears ago. I love Kellog’s Breakfast last year too! All 3 are excellent by themselves with some salt and pepper, or on a BLT! Black Krim tomato and Green Zebra tomato – these two will always have a space in my garden for their great tastes (richness from the Black Krim, citrusy zest from the Green Zebra). And then there’s Dragon Tongue beans, which I actually prefer a little underdeveloped and snipped up raw in a salad. YUM! I’m new to growing heirloom/open pollinated varieties and seed saving, however last year, I grew Cherokee Purple and Black Krim tomatoes. Had problems with cracking, as seems to be the case with most heirlooms. However flavor was exceptional, with the edge going to the Cherokee purple. Costata Romanesco summer squash – lightly pan seared. Unfortunately the squash vine borers enjoy it as well. I just love my dad’s Heirloom green beans. He’s been growing them since he was a kid and seems to have passed them around to half the town. People continue to just have great success growing them in our area. They’re wonderful. I look forward to growing them in my first garden at my new home this year. My favorite heirlooms: Rattlesnake Pole Beans, Pink Brandywine Tomatoes, and Buttercup Winter Squash. We’re big fans of High Mowing Seeds as well. Last year we tried Hungarian Hot Yellow Wax Peppers and they are a new favorite. We really enjoy Ozette potatoes and windsor fava beans. Some years we have less than 100 days frost free and finding cultivars that can cope with our weather is a real challenge. Love purple podded pole beans and fordhook zucchini. Aunt Ruby’s German Green, Paul Robeson, Pink Brandywine tomatoes. The green stemmed rhubarb I got from my father-in-law. An unnamed soft neck garlic I’ve been growing for years. I am just discovering heirloom vegetables and am looking forward to finding some delicious tomato varieties to try out this year. Thanks for the opportunity to win some. I am new to heirloom gardening, since this is my first year with a garden of my own, but I absolutely love brandywine tomatoes that I have bought over the years at farmers markets. I am trying a handful of additional heirlooms in my garden this year, so I’ll know better what I like next year. Okra handed down from my Grandfather. And, my wife loves Black Cherry Tomatoes. As someone who struggles at times to get my veg to grow Scarlet Runners are my favorite. I just sow and water and magically lots and lits of beans appear.